Day trip from Camerons Cottage to Applecross on the west coast of the Highlands of Scotland. Allow about 3 hours to get to Applecross….about 100 miles. A round trip of just over 200 miles. Applecross is a small hamlet on the west coast with a large sandy beach and amazing views of the triangular Cuillin Mountains on the Isle of Skye opposite. This is a beautiful awe inspiring journey driving past some stunningly beautiful dramatic scenery. It can only be appreciated fully in the Spring/Summer months with the long daylight hours. Do look at the weather forecast for the west coast. Aim for the Applecross Inn for lunch or take a picnic. Leave Camerons and turn left onto the B852 towards Whitebridge. Travel for about 2 miles on a twisting single-track road to the T-junction and turn right onto the B862. You are now on the road heading towards Fort Augustus and on the site of the original road built by General Wade linking Inverness to Fort Augustus. Pass the small hamlet of Whitebridge where the original arched White Bridge built by General Wade can still be seen today. Drive past the Whitebridge Hotel which is a long established Highland Hotel built in 1899. Carry on climbing up the road passing heather moorland and grasslands where herds of stags and hinds are frequently spotted roaming freely along with numerous hardy sheep. 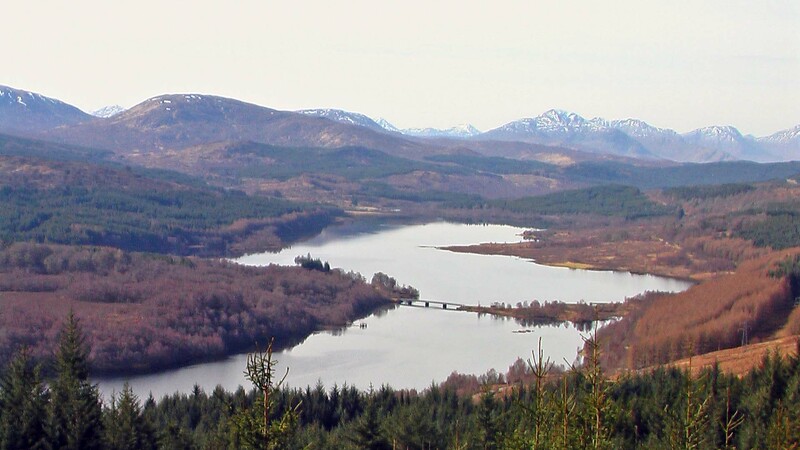 There is a splendid view point with parking bays at the very top at a height of 1162 ft. On a clear day, looking back the way you came, you can see the four lochs, Lochs Mhor, Ruthven, Duntelchaig and Ashie and then east to the Monadhliath Mountains. Ahead of you on a clear day you can view the snow covered Nevis Range with the high peak of Ben Nevis at 4406 ft in the distance. Ben Nevis is the highest mountain in the British Isles. Start the descent down the mountains driving alongside picturesque Loch Tarff with snowy mountain peaks in the distance. This loch was featured in the opening frames of the film 'Local Hero'. Drive alongside the loch. Between Loch Tarff and Fort Augustus there is a parking bay on the left affording great views over Fort Augustus and the Abbey. The Fort was completed in 1730 and named after William Augustus the younger son of George ll. Today almost nothing remains of the original military ‘Fort’ although parts of it were incorporated into the Benedictine Abbey and School which was built in 1876 on this site. The community of Benedictine monks were unable to sustain themselves and left in 1998. The recently redeveloped site now provides self catering holiday accommodation and residential apartments. Just before entering Fort Augustus it is well worth stopping for the panoramic view of Loch Ness looking north-east towards the city of Inverness far away in the distance. On entering Fort Augustus you will see a large sign to the old Fort Augustus Abbey on the right. Turn left here onto the A82 main road passing The Lovat Arms Hotel on your right. Continue on this road which, after a few miles, crosses over the Caledonian Canal. The canal links Loch Ness to the next loch along the Great Glen Fault Line - Loch Oich. The road runs parallel with the Loch Oich shoreline to the next small village of Invergarry. There is a garage on the right just before Invergarry - note that petrol will be more expensive the further west you go so do try and go on a full tank. Just after the garage turn off right onto the A87 – signposted to Skye Bridge & the Kyle of Lochalsh. About 2 miles along this road at Glengarry on the left there is a car park and a relaxing forest and river walk. The road now starts to wind and climb quite steeply above the picturesque Loch Garry. After a climb of about 7 miles along the road there is a parking space on the left with dramatic views and a good photo opportunity of Loch Garry. Note the small private road bridge crossing the loch. People have pointed out to us that Loch Garry actually looked like a map of Scotland even with its own ‘Forth Road Bridge’. Pass the Cluanie Inn after about 45 minutes and skirt Loch Duich with the ancient battlements of Eilean Donan Castle reaching out into the loch. A good castle visit and an excellent photo opportunity. Just before Balmacara turn right onto the A890 to Stromeferry although there is no actual ferry service there. Drive around pictuesque Loch Carron with its white cottages on the water front and then onto the head of Loch Kishorn. Turn left on the next road ‘Bealach-na-Ba Pass’ otherwise known as the Old Cattle Pass which is the highest road in Scotland. Originally the only way to get to Applecross was by sea until this Cattle Pass was built in the 18th Century. Even then access to Applecross used to be easiest by sea especially when the Cattle Pass was closed by snow in the winter months. This narrow road zig zags spectacularly for about 11 miles with several hairpin bends and is not a route for the squeamish but it is well worth the effort for the spectacular views of hidden lochs nestling at the base of huge mountains. The road attains a height of 2053 feet and at the top there are breath-taking views across the Inner Sound to the dark triangular Cuillin Mountains opposite on the Isle of Skye. These Cuillin Mountains include 12 Munros – the name given to mountains in Scotland over 3,000ft high. Collecting Munros, or Munro-bagging, is a very popular sport with experienced climbers and currently there are 284 Munros recorded. In the foreground are the lesser known Isles of Raasay and the rocky outcrop of Rona. Stretch your legs at the top and enjoy the relaxing views from the welcome benches. Now begin the descent to Applecross Bay where there are magical panoramic views over to the Inner Hebrides. Look across to the famous Isle of Skye with the triangular bare, black volcanic peaks of the desolate Cuillins mountains. Although Applecross is one of the remotest villages in Scotland it is a very popular tourist destination. The name Applecross derives from the Pictish words Apor-crossan, meaning the confluence of the River Crossan and is locally known as ‘the street’. A small line of white cottages border the tiny village street on one side facing the sea wall on the other side. Applecross retains a simple unspoilt charm which is very much appreciated in the hectic lifestyle of today. Applecross was one of the earliest Christian settlements in Scotland, second only to Iona. In the year 673AD the Irish Monk Maelrubha founded this Christian settlement and declared the surrounding area a ‘Sanctuary for all fugitives’. Maelrubha established his monastery here and spread the gospel from Applecross to Lochcarron and into Easter Ross. Unfortunately nearly every trace of Maelrubha's settlement in Applecross has long disappeared and Clachan Church now stands on the site of the original monastery. The focus for the development of the area was Applecross House. This imposing house, strikingly white against its background of mountains, was built in the years to 1740 for the Mackenzies of Applecross. Serviced entirely from the sea, the Applecross Estate employed significant numbers of farm workers, shepherds, gamekeepers, gardeners, domestic staff and fishermen. The village today known as Applecross, complete with Milton just to its south, grew largely to service the needs of the Estate. Today the estate attracts visitors to its walled garden and the Potting Shed Restaurant within it. On the road into the village from the east is the Flower Tunnel Café which serves a range of meals and snacks within a polytunnel structure of the type more usually used as a greenhouse. Enjoy a well earned lunch at the Applecross Inn after this dramatic but worthwhile drive. This is a popular family run Inn on the shore of the bay which has won various awards for its food especially the local seafood. Take a leisurely walk to the end of the peninsular or around the horseshoe shaped sheltered sandy bay. When you are ready to return home take the only other road out of Applecross around the top of Applecross Bay. This scenic meandering coastal road was only built in 1976 as an easier alternative to the mountainous Cattle Pass which was very often impassable in the treacherous cold winter months. Drive along the coast passing some beautiful secluded sandy beaches looking across the Inner Sound to the long narrow island of Raasay, with its population of about 200, and the isolated outcrop of Rona, home to a Marine Testing Station. Look out for the lighthouse at the northern end of this island. Drive alongside picturesque Loch Torridon which marks the northern boundary of the Applecross peninsula. Look out for Shieldaig Island in the loch where a heronry has been established among the tall Scots pines, a remnant of the original ancient Caledonian Forest. Eventually join up to the main A896. Pass the picturesque white fishing settlement of the village of Shieldaig on the southern shore of Loch Torridon nestling at the foot of enormous looming mountains. Continue along the loch side to the village of Torridon, a popular climbing centre as it encompasses many high peaks made of ancient rocks and red Torridonian sandstone. Drive inland through the Beinn Eighe Nature Reserve to Kinlochewe and turn right onto the A832 passing various smaller lochs along the way. Just after Grudie skirt Loch Luichart and turn right onto the A835 and pass the small villages of Garve, Contin and Conon Bridge. At Tore turn right onto the A9 and cross the Beauly Firth and then on to Inverness. Take the B862 signposted to Dores and follow Loch Ness all the way through Inverfarigaig and then passing Boleskine graveyard on your right, the burial ground of the Fraser Clan. The graveyard marks the site of a pre 1777 Church of Boleskine Parish though nothing obvious remains today. The small stone building in the grounds is a mort-house where a guard was stationed to ensure the safety of the coffined bodies in the days when grave robbing was a real fear. Further up the hill on the left is the large Private residence of Boleskine House which was built in the late 18th Century as a hunting lodge by the Honorable Archibald Fraser and has an interesting history. Continue to the village of Foyers which was once an important staging post on the old military road from Inverness to Fort Augustus.It was also the first village in the Highlands to have electricity in each house powered by the British Aluminium Company using hydro-electric power from the waters of the Falls of Foyers which is well worth a visit to look at a spectacular waterfall gushing into Loch Ness. Then home to Camerons Cottage.